Jurassic World is the fourth movie in the Jurassic Park series, though Jurassic Park III came out 14 years ago, in 2001. Needless to say, it's been a long time since we've returned to the park, but in this case the wait was worth it. Jurassic World is the newest and best in technology. The park, which is located in Costa Rica, has about 20,000 visitors daily, and today two of those visitors are Zach (Nick Robinson) and Gray (Ty Simpkins), who are the nephews of Claire (Bryce Dallas Howard), one of the higher-up managers of the park; their parents have sent them to the park while they are busy getting their divorce finalized. Claire is far too busy to actually hang out with her nephews at the park, though, so she assigns her assistant, Zara (Katie McGrath) to them. The problems start to begin when the park can't seem to find its newest dinosaur, a Tyrannosaurus Rex-sized specimen that was created in a test tube. Owen (Chris Pratt), who works with the raptors, is sent out to take a look at him, but the hybrid is not in his assigned area ... or so they think. As you can imagine, once the dinosaur escapes, all hell breaks loose, and the top priority is quarantining all of the park guests so that no one gets killed like the last time. 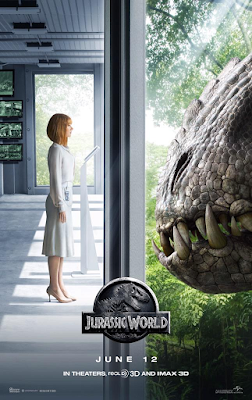 A few cast members I didn't mention yet are Judy Greer (in a small role as Zach and Gray's mother), Vincent D'Onofrio as "the bad guy," and Jake Johnson (New Girl) and Lauren Lapkus (Orange is the New Black) as two of the Jurassic World employees who work in the control room. The movie has some fun references to the original movie too; Johnson's character is wearing a shirt with the Jurassic Park logo, and Claire asks him where he bought the shirt, as it's in "poor taste since people died there" (his response: eBay, for $150). B.D. Wong, from the first movie, is also back as the lab director, and Omar Sy also has a small roll, as one of the raptor handlers/trainers. Yes, see this movie. I saw it in 2D because I had heard the 3D wasn't that great overall, but one of the theaters near me offers 3D IMAX which would be fun to see. Although I still like the first Jurassic Park better (and saw it more recently than II or III, since I saw it in 3D two years ago), this one was definitely flashy and will keep you entertained; there's some light humor throughout, too. I'll also say that this movie was scarier than the first one, for me - I'm not sure if it's because the dinosaurs looked more realistic, or what, but there's a few "jump in your seat" type scenes in it, so it might not be great for younger kids to see. I have a feeling this is not the last time we'll see these dinos on screen, though, as more sequels have been talked about, and I look forward to seeing the next installment in the series. 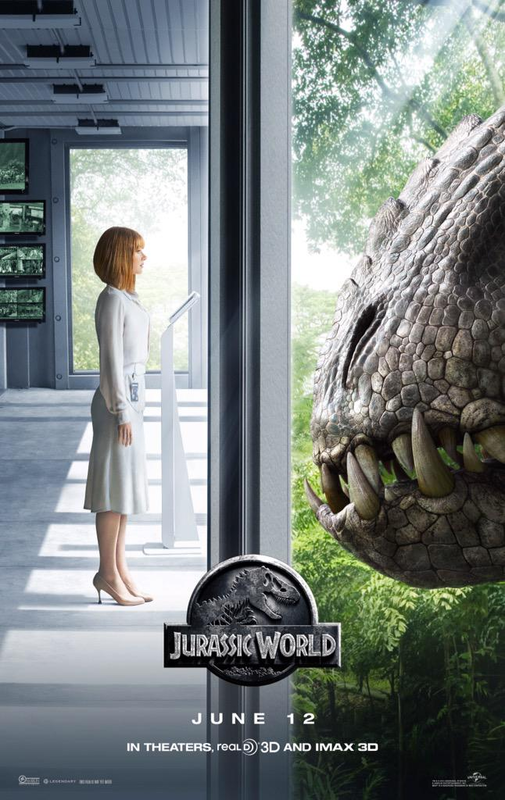 Jurassic World is in theaters today, June 12th, and is rated PG-13 with a runtime of 124 minutes. 4 stars out of 5.